Walnut City, Calif. – October 8, 2015 – Tenda Technology Inc.®, a subsidiary of Shenzhen Tenda – an experienced, global brand of wired and wireless networking hardware – today announces availability for the TEG3224P in America. 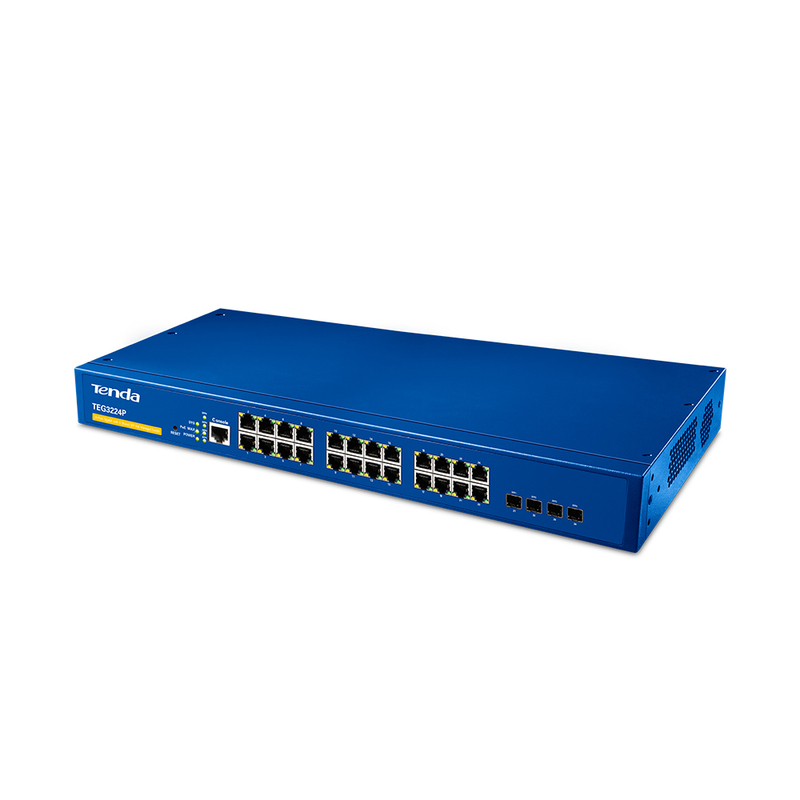 With comprehensive security features, this stackable, websmart 24 port managed switch is designed to build a safe and smart wired network. Providing 24 10/100/1000 auto-negotiation RJ45 ports and 4 reusable Base-X Small Form-Factor Pluggable (SFP) ports, it supports both IEEE 802.3af (15.4W) and 802.3at (30 W) standards. The TEG3224P supports complete network management via an easy-to-use web interface, including a wealth of security options and features. 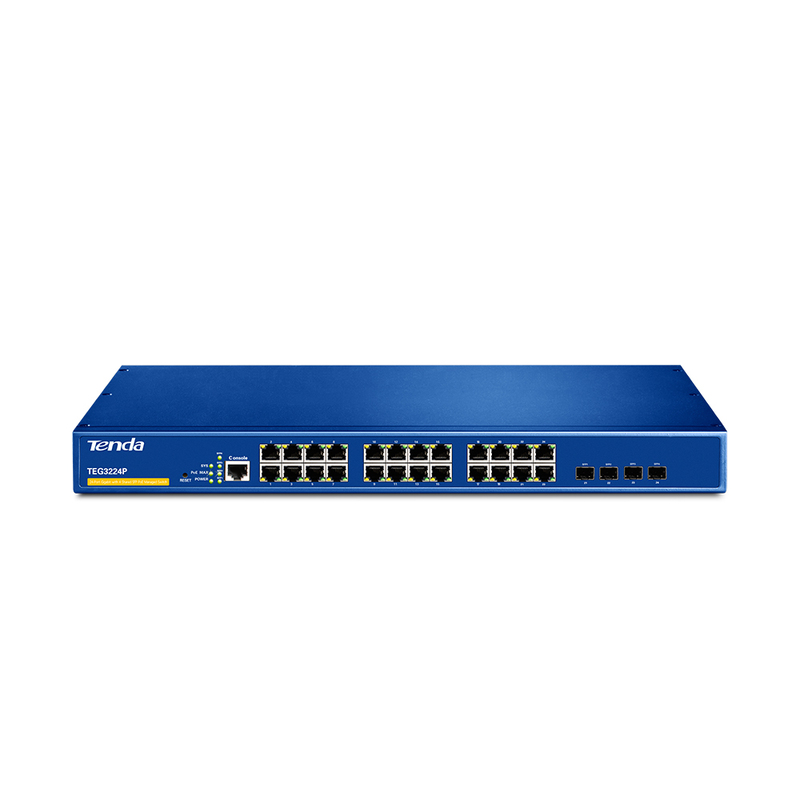 Beyond its hardware-level security, it offers ARP attack defense, worm attack defense, DoS attack defense, IP/MAC/PORT/VLAN binding, and MAC filtering – strong safety bulwarks for a strong switch. In addition, 802.11x and MAC authentication lend further security, along with port security and isolation, SSH 2.0, and user classification management. Twenty-four Gigabit Ethernet ports, along with four SFP combo ports, offer flexible port combinations for plenty applications. The dynamic PoE power supply monitors port output power and automatically matches PD equipment, constantly ensuring energy efficiency and security. The 4 combo ports are shared with the 24 Ethernet ports. For example, if an SFP transceiver is plugged into an SFP port, then one Ethernet port is disabled even if a cable is plugged in. The TEG3224P supports VCT cable diagnosis to quickly locate fault points in lines. The TEG can tell you which line and how far down the line an error occurs. This saves valuable time when diagnosing faults in a large system. Line diagnostics can be painstaking with a 24 port Gigabit switch – VTC is designed to eliminate this hassle. The TEG3224P Gigabit Ethernet switch with SFP ports is available at all the resellers of ASI (http://www.asipartner.com/).